The Rocstor Enteroc S630 SAS Rackmount RAID Storage System offers 64TB of data capacity housed in a 3U rackmount enclosure. Inside its sixteen hot swappable bays are SAS enterprise hard drives that are more reliable than standard drives and are designed to run 24 x 7. In addition, each of the drives spins at a speed of 7200 rpm and has 64MB of cache. It comes with two controllers that provide four SAS 6 Gb/s interfaces. 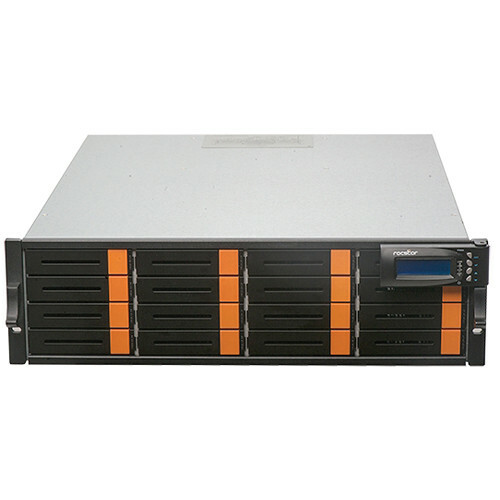 For added reassurance, it is equipped with redundant 500W power supplies and offers RAID support. The Enteroc S630 is outfitted an 800 MHz dual-core RAID-On-Chip processor that manages the data on the drives. Moreover, it supports RAID levels 0, 1, 10 (1E), 3, 5, 6, 30, 50, 60, and JBOD to provide data redundancy, performance, or both. Further storage expansion is made possible by connecting an optional SAS expansion chassis to one of the two 6 Gb/s SAS expansion ports.